E-MAIL ADS TO: ads@appletonmonthly.com. Deadline for display ads is the 15th of the month prior to the issue’s publication. Please include all art, copy, and camera-ready advertising. CANCELLATIONS and ad size changes are accepted until 5 p.m. of the 12th. PROFESSIONAL DESIGN SERVICES are available to advertisers for their ads in the Appleton Monthly at no charge. PROOFS (on ads 1/4 page in size or greater) are provided on request. Proofs are for checking accuracy only. Substantial changes in composed ads may incur production charges. All rates on this card are net. No commissions allowed. The advertiser or agency will be liable for a 1 1/2% monthly finance charge on past due billings. Payments due by the 10th of the month. The Appleton Monthly reserves the right to suspend credit privileges for nonpayment. All new accounts will be pay-in-advance until credit application is submitted and approved. All copy must be in good taste and in accordance to our standards as to form, subject matter, size, illustration and typography. Advertising that is considered detrimental to the public may be refused for publication. 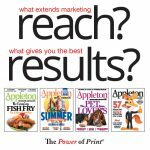 The publisher of the Appleton Monthly reserves the right to revise, reject or cancel any advertising at any time. The Appleton Monthly is published on the first day of the month 12 times a year, and is distributed at 525 locations throughout Appleton, the Fox Cities, and Heart of the Valley. If a holiday should fall on the first day of the month, the Appleton Monthly will be distributed the following day throughout the marketplace.